al countryside, often the site of stories about marginalisation, migration, communities left to their own devices and lost opportunities. Rural is still a synonym of backwardness, poverty, and exclusive dependence on the agricultural sector. Far from the romantic vision rural areas enjoy in many European countries. Yet there are some dissident voices that tell of success stories and some initiatives that enable a glimpse towards the future to those long forgotten areas, too far from the political centres that count. 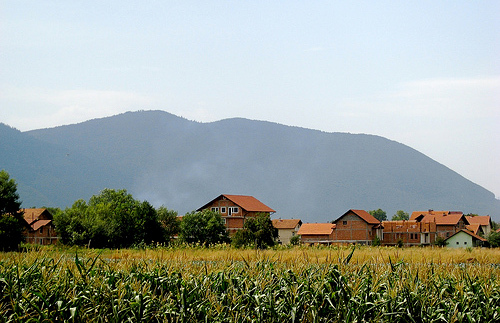 Land and agriculture are still important economic factors in the Western Balkans, where the proportion between arable land and total surface area varies from 23% in Croatia and 66% in Serbia. A first aspect that emerges, and a necessary premise that holds true for all statistics regarding the primary sector in the Western Balkans, is the lack of an updated, homogeneous and comparable database. In the case of Croatia, where the data on land use has been harmonised with Eurostat, the reference is to utilised agricultural area (UAA). Whereas for other countries, there is no clear distinction between the land that is actually used and that which isn’t. Abandoning and not using land are the most common consequences of the transformations of the primary sector in transition countries. This is both due to the consistent migrations towards urban centres, the parcelling out of land as a result of the process of 'decollectivisation' which started at the beginning of the 1990s. In the Balkans, the countries in which land has been most severely abandoned or left underutilised, for different reasons, are Albania, Bosnia Herzegovina and Kosovo. Albania because of a particularly complex process of land redistribution, which gave way to serious uncertainties about land ownership, which in turn limited the development of a land market and thus drove away possible investors. Bosnia and Kosovo after the forced displacement of entire communities which, especially in the more marginal areas, brought with it illegal occupations and failed returns, and where it is thus necessary to manage extremely controversial problems. During the transition years, the agricultural sector went through a prolonged phase of decline in which it did not fulfil its commercial objectives and instead ended up carrying out a much more social function. As the high number of small units of production focussed on subsistence or semi-subsistence demonstrates, this is still very much the case even 20 years since the dissolution of Yugoslavia and the fall of the regime in Albania. The average size of agricultural businesses is in fact under 2 hectares (ha) in Albania, Kosovo and Macedonia, 3 in Croatia, and between 3 and 4 in the other countries. This dynamic is reflected in a dual structure, in which small family units coexist with modern commercial businesses. Overall the size of farms is smaller than those in the Mediterranean part of the EC (Greece, Italy, Spain, Portugal) in the 70s. (J. Lampietti et al., 2009). Great structural problems thus exist, which, however, don’t keep the agricultural sector from maintaining a strong position in terms of the overall economy and employment, this is also due to the not-so-brilliant performance of the other sectors. In the EU the primary sector accounts for 1.8% of the gross domestic product (GDP) and employs less than 6% of the active work force, whereas in the Western Balkans the situation shows very different proportions: in Albania the primary sector accounts respectively for 18.5% of the GDP and for 57% of its employed; in Bosnia Herzegovina for 9.1% and 20.6%; in Croatia, 6.4% and 13.2%; in Macedonia, 10.8% and 18.2%; in Montenegro, 7.5% and 28%1; in Serbia, 12% and 21.4% (Agripolicy.net data)2. In Kosovo between 19 and 15% (2006 data), but the estimates risk being misleading. Kosovan institutions in fact fix the rate of official unemployment at 40%, data that should be questioned considering the weight of its shadow economy, especially significant in the agricultural sector (UNDP 2011). Training sessions held in Bosnia-Herzegovina and in Italy during the first year of Seenet II activities on the development of agriculture in the mountainous regions of BiH, headed by the Piedmont region, showed an increase in interest for this sector on behalf of all of the Bosnian partners. The Programme also foresees the drafting of a guide book on organic and local products in the area of the Zenica-Doboj Canton. Still within the SeeNet II Programme, the action on the business promotion for the trans-national growth of integrated local production systems, headed by Friuli Venezia Giulia, includes activities connected to organic production, especially in the Vukovar-Syrmia county. Furthermore, despite considerable differences among the countries, the transition from planned to market economy has been marked by numerous contradictions and inefficiencies, both from a structural and a political point of view, which in many cases have hindered the development and consolidation of the chains of production. In this scenario farmers were not given incentives to modernise, become more specialised and increase the competitiveness of production systems. Thus, for a long time, the sector wasn’t able to attract significant investments. After the decline that followed the transition process and - for some countries - the conflicts, the volume and profits of production started to grow again, albeit with some natural oscillations mainly due to the weather conditions. Grain is the main crop and occupies an important quota of arable land: approximately 40% in Albania, almost 50% in Kosovo, over 50% in Bosnia-Herzegovina, over 60% in Croatia, Macedonia and Serbia3. Only in Montenegro, where potatoes and vegetable crops make up respectively 30% and 20% of arable land, does grain play a slightly less important role (approximately 20%). After grain the main products are vegetables: over 10% in Macedonia and Bosnia Herzegovina, and industrial crops (oilseed and beets) that exceed 10% in Croatia and Serbia. Considering volumes instead, fruit crops stand out with 26% of Croatia’s output, 19% of Albania's, 16% of Serbia's and 12% of Macedonia's (T. Volk, 2010). Despite the levels of the EU not having been reached, in the last decade profits have grown significantly, proving that after all, at least for the business end of the agricultural sector, improvements have actually taken place, both in terms of efficiency and production techniques. A separate case must be made for the animal breeding sector, which, despite progress in almost all countries, still shows structural weaknesses in terms of legislation, complete fulfilment of sanitary standards (referring to the EU framework, especially in terms of control systems), and the introduction of traceability systems (animal identification and registration) ( EC Country Progress Reports 2010). Overall the sector is dominated by beef and milk farming (T. Volk, 2010), despite the single countries showing significant differences in terms of traditions, types of land and diets connected to religious beliefs. In this regard, Serbia (36%), Croatia (26%) and Macedonia (16%) produce a significant quantity of pork, while Albania, and, to a certain degree, Bosnia Herzegovina, Kosovo and Montenegro, stand out for their sheep and goat farming. Furthermore Bosnia shows an additional internal diversification that reflects the administrative division following the Dayton Peace Accords of 1995. Important elements in the analysis of the evolution of the agricultural sector can also be derived from the structure of the trade balance: observing how much raw materials and processed products affect imports and exports. Obviously, the higher the imports of processed products and the exports of raw materials, the weaker is the sector within that country. On the contrary, exporting processed products and importing raw materials is often the symptom of a healthy sector, capable of internalising a considerable amount of the added value in the process of product transformation. From this point of view most supply chains show structural weaknesses and a limited ability in keeping the added value within the territory. Trade is generally in constant growth both at the regional and the international levels, with the EU as the primary business partner. Among the most relevant data is the importance the food and agriculture industry on the total import-export ratio: it is much greater than EU averages (which recorded 5.7% on the total amount of exports and 6.3% on the total amount of imports in 2008), and the negative trading balance of this sector, with Serbia being the only country to show a positive balance between imports and exports in the food processing industry. Observing the single countries, the food and agriculture industry amounts to less than 10% of imports only in Croatia and Serbia and is close to, or even greatly exceeds 15% in all the other countries. The weight of exports tends instead to converge around 10% with the exceptions being Serbia (18%), Albania (6.6%) and Bosnia (6.3%). In addition to rampant situations of poverty, rural areas have to deal with shortcomings in terms of infrastructures, public services (social, health and education) and job opportunities that are not in the primary sector. In this context migration has increased, especially regarding the younger generations, both towards urban areas as well as abroad. And, as for all rural areas, the haemorrhage of human capital risks making the decline and depopulation process irreversible not only for the more peripheral areas and the smaller villages, but also for those medium-small towns that often constitute nerve centres for the supply of important basic services. At risk is the loss of traditions, history and skills that are the direct consequence of centuries of interactions and reciprocal adaptations between humankind and the surrounding territory. The resources that in many areas of the Balkans have already been eroded (at times in a substantial manner) as a consequence of socialist planning and the conflicts marked by the forced removal of entire communities. The economy of rural communities is greatly based on the primary sector, which in marginal areas is characterised by structural problems that are even more vicious than in the less peripheral areas. Despite these conditions, in relative terms, the rural population in the Western Balkans remains greater than that of the EU countries on the Mediterranean (Greece, Italy, Portugal, Spain): 46% of versus 36% (J. Lampietti). 2 Data on Kosovo was not available at the time of the drafting of the article. 3 Approximate averages of the period 2000-2008 based on Agripolicy.net data. N. Bogdanov, J. Lampietti and others, The Changing Face of Rural Space, Agriculture and Rural Development in the Western Balkans, World Bank Publications, 2009. G. Prevelakis, I Balcani, Il Mulino, Bologna 1997.